hi again its vicky this time! i wanted to write this one as its prob my fav place so far! so we got a mini bus to vang veing which took 6 hours in total very long but beautiful green scenery so it was worth it. we also met 6 more friends, 3 from holland, 1 from switerzerland, 1 from canada and 1 from england! so we got to vang veing weather absoultly boiling, the hottest i think we habe been in. we checked in to our suest house and went for a stride around the very small but lovely town. it was def a backpackers place to be as it was all western people there, only coz the big attraction was tubing!! o my goodness but it was the best fun ever! 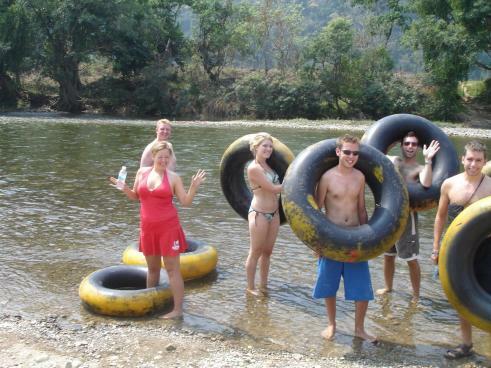 so we got our tubes and went to the river, and after 5 mins you stop at the bar, amd stay there for a bit, but as im not a big drinker i was happy enough on my diet coke, every one else was getting a bucket of vodka and red bull for $4 that 2 pd sterling!! a bucket had about 5 measures in it and one can off red bull. glad i dont drink like them!!! think people in skea wud be happy out here! so once you finish your drink you hoped bak on the tube to the next bar! every one was good tho they didnt drink at this one instead they done jumps where you were 40 foot high and swong across and fell in! obvoulsy me the big wimp wudnt do it, superwomen shel did no bother. bloody crazy! she done it at quite a few stops, and she was feeling her stomach muscles for the next week. so we stopped at quite a few stops along the river but i must say for the amount of drink taken every one was very sober! it was a long journey home again as we had to drift down the river for a hr and it was gettin cold and dark! the next day it was raining so we decided to have a lasy day, basically we all went to the nearest bar and watched friends we stayed for breakfast, dinner and tea, we most off watched every episode of it! so next day we are off to vientenne!!!! theres not much to write as for a city it was quite and basically crap!!! thats all i have to say for it.